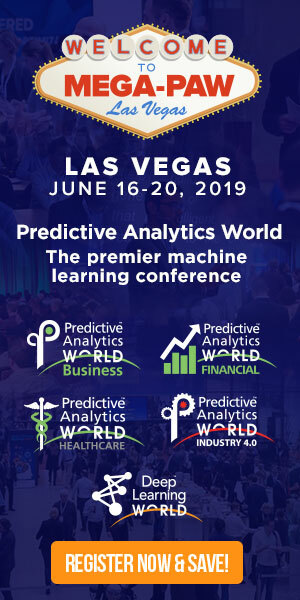 In anticipation of his upcoming conference presentation at Predictive Analytics World for Industry 4.0 Las Vegas, June 16-20, 2019, we asked Richard Boire, Senior Vice President at Environics Analytics, a few questions about their deployment of predictive analytics. Catch a glimpse of his presentation, Demystifying Machine Learning-An Historical Perspective to What is New vs. Not New, and see what’s in store at the PAW Industry 4.0 conference in Las Vegas. A: One key difference is that in the area of consumer behavior, the emphasis of predictive analytics is on improved targeting of a given behavior such as response, defection, and risk. Within manufacturing, though, we are still building models to predict a desired target outcome. However, the emphasis here is to really understand key processes and tasks that optimize a given target behavior. For example, our previous work in the travel industry was attempting to improve customer satisfaction scores. But through predictive analytics, our key deliverable was identification of improved processes within their travel operations that would ultimately yield improved customer satisfaction scores. This ultimately achieved a 300% ROI and $200K annually. In building models within manufacturing, one might argue that the increased emphasis in identifying key processes and tasks is more difficult when utilizing deep learning techniques which is the mathematical underpinning of artificial intelligence. Deep learning models in predictive analytics are about improved targeting and less about explainability of features and variables that would provide insights on how to improve the processes and tasks within a given manufacturing operation. A: Over my many years as a predictive analytics practitioner, most of my experience has been focused on predicting consumer behavior although as stated above we have had experience on the operations side. Besides the travel example above, we did work for a bank whereby predictive models were built to improve the customer service operations where again customer satisfaction was the desired outcome. We identified branch activities or processes that could be improved or eliminated in better service of the customer. A: As a predictive analytics provider, our solutions deliver value in two ways to our clients. First, we identify the most appropriate groups of consumers to target for a given business initiative. Second, we identify the key characteristics within the given model that allow the business to act on these characteristics in their effort to improve the desired business outcome. This is why it is imperative that the explainability of our models is a fundamental deliverable to all our clients. A: I always use this example when I am teaching or conducting seminars in data mining and predictive analytics . In an upsell model that we built, we demonstrated that the bank in one marketing campaign had incremental profit of $120,000. Keeping in mind that the bank conducts over a hundred marketing campaigns a year, it was just a matter of time before data science became a core discipline for this bank. A: In my current role within Environics Analytics, I have a newfound appreciation of our data in being able to provide enhanced communication opportunities . With over 22000 variables at a geographic level, insights can be drawn about a given company’s customers that is simply unavailable from the company’s own internal data. A: Once again, I’d like to emphasize that data science is a discipline that utilizes a 4 stage process which has not changed. Even the many steps involved in each stage are still the same. What has changed this paradigm is automation and the tools that increase this level of automation with the ultimate goal being increased productivity. But in achieving this goal, the practitioner needs to deeply understand the balance between increased automation versus manual intervention in building robust predictive analytics solutions. Don’t miss Richard’s presentation, Demystifying Machine Learning-An Historical Perspective to What is New vs. Not New, at PAW Industry 4.0 on Wednesday, June 19, 2019 from 4:20 to 4:40 PM. Click here to register for attendance.